The current level of tension between Russia and the West has led many experts to look to the Organization for Security and Cooperation in Europe for solutions. 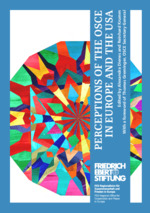 In this new publication, the FES Regional Office for Cooperation and Peace in Europe has asked experts from 14 member states, including Russia and the United States, to assess the role of the OSCE in their countries. The publication hopes to clarify each country’s perceptions of the OSCE and thereby bring into sharper focus the goals and aims of the organization, which historically made such an important contribution towards ending the Cold War.